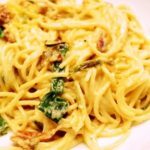 Spaghetti carbonara with spring onions: There is nothing quite like a carbonara and since the spring onions are flurishing, we added a few to create this wonderful dish. 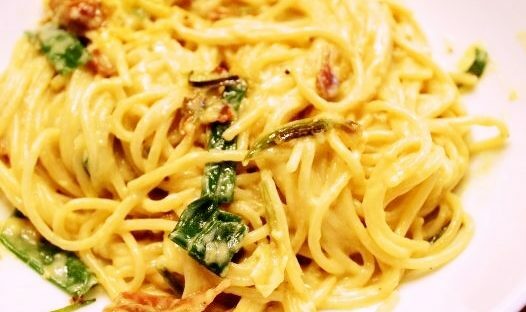 Carbonara is typically Roman. You will find it being served in restaurants throughout Rome and each restaurant will have its own method of making it. It can be a little tricky to create the custard-style sauce but practice will make perfect! But please don’t worry if it doesn’t turn out perfectly – it will taste amazing! 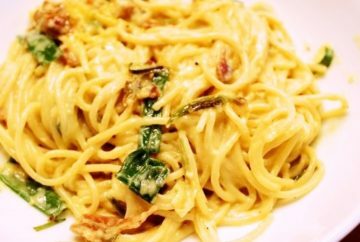 The addition of the spring onions really takes a basic carbonara to a whole new level, so enjoy. First prepare the spring onions. Cut the root ends of the onions off and separated the white bulbs from the green leaves. Slice the bulbs in half and then chop. For the leaves stack and slice lengthwise into ribbons. Heat the olive oil in a large frying pan large enough to handle a pound of cooked spaghetti, over medium to low heat. Add the pancetta and cook until crisp. 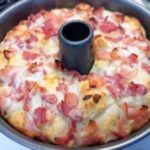 Tilt the pan to concentrate the oil in a smaller area which will reduce the cooking time. Carefully add the white wine and continue cooking until reduced by half. Remove the pancetta and add the green onion bulbs, cooking until soft, 4 – 5 minutes. While you are cooking the pancetta and onion bulbs, get well-salted water boiling in a large stock pot. Cook your spaghetti until it’s very al dente (your pasta will continue to cook in the sauce). About 2 minutes before the pasta has cooked, add the green onion leaves to the frying pan and cook until softly wilted. Reserve up to a cup of pasta water then draining the pasta and add the spaghetti and pancetta to the frying pan. Toss the pasta in the sauce for 1 minute, allowing each noodle to get coated with the sauce. Pour the egg/cheese mixture into the hot pasta, using a spoon to quickly distribute the mixture. Immediately remove from heat and continue tossing and stirring for 1 – 2 minutes. At this point add the reserved pasta water a little at a time and stir, until the sauce is a nice creamy consistency, not too thick but not too thin.